Its the result of a bunch of missed connections, but the strange reality is that I have never recorded Los Lobos for NYCTaper before in the nearly eight years of existence of the site. Los Lobos is one of the most powerful and prolific live bands and last year they celebrated their 40th year of existence, and I’ve seen them a bunch of times over the years, but not for NYCTaper. Only Acidjack and JFCB have recorded them for the site — a Brooklyn Bowl show back in 2012. They’ve also traditionally welcomed tapers going back decades. And as a special celebration, tomorrow I will post a “new” transfer of a 1996 recording of Los Lobos at Mercury Lounge — a show recorded by my friend Eric Vandercar that I attended as Eric’s “blocker”. In Port Chester on Friday, the Capitol Theatre was really the perfect venue for this band. After a superb opening set by Alejandro Escovedo (coming soon), Los Lobos took the stage to a very engaged crowd. There was none of the persistent yapping you hear at other shows. This was a seated and attentive crowd that Los Lobos acknowledged from the outset. The band took their time working their way into this show with an early run through some classics before they welcomed Alejandro out for a couple of numbers. It was an extended and well played version of “The Neighborhood” that kicked this show into another gear. David Hidalgo’s blues guitar riffs were showcased during an incendiary 14-minute “Just A Man” before the fan favorite “Kiko” brought the crowd to their feet for the remainder of the show. The band gave a nice acknowledgement to Jerry Garcia (the venue’s side bar is called “Garcia’s”) before the performance of the set-closing “Bertha”, a song Los Lobos covered all the way back in 1991 for the Deadicated compilation. We’re streaming it below. But the band wasn’t done. The encore segment began with a brief blues jam that led directly into Cesar Rosas’ “Don’t Worry Baby” which then transitioned to “May Y Mas” — another extended version that we are streaming below. The final segue was a neat back and forth between the band’s one Top 40 hit “La Bamba” and the same-three-chords rock classic Good Lovin’ after which the band bid an appropriate good night. Los Lobos tour continues next week with a brief run through the Northwest, dates here. I recorded this show with the Schoeps mounted on a seven foot pole located at the front right corner of the soundboard cage. As this was seated show, my location was Orchestra Row J, Seat 109. The direct line at the stacks and the wonderful sound quality of a well mixed room resulted in an outstanding recording. Enjoy! 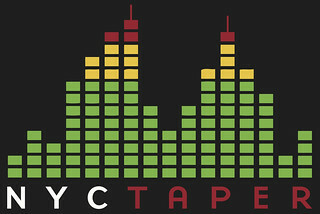 If you download this recording from NYCTaper, we expect that you will PLEASE SUPPORT Los Lobos, visit their website, and purchase their official releases from the Store at their website [HERE]. Thanks a lot for sharing your recordings, I’m looking forward to enjoy Los Lobos. Song 17 (unknown) = Volver Volver. Thanks for this fantastic recording. Los Lobos is one of the most under rated bands of all times, probably right after Booker T & the MGs. Thanks for taping and sharing. ONWARD thru the Fog! Indeed it is. Thanks for the info. Its been updated. Huge thanks for the Wolves! Glad to hear that David uncorked a gem on Just A Man. Thanks again for sharing this one.